This post was updated October 13th, 2016 with recent Twitter changes. About a month ago I participated in Buffer chat. The topic was about social media hashtags and Facebook seemed to be the most elusive topic for hashtags. One piece of information in this article was a study of Facebook which uncovered that posts without hashtags do better than those with hashtags. That is what led to me creating this infographic and post. You’ll find the full infographic at the bottom of this post. I also broke down each section into smaller graphics for the purpose of this post. I cover each section in more detail to help explain the intricacies better. Jump right to the big infographic. Creating the perfect Twitter takes a lot of moving parts, but these tips will help give you a framework. Twitter doesn’t give you much to work with on characters although it was recently increased. You still only have 140 characters to begin with but each element now takes less characters away. 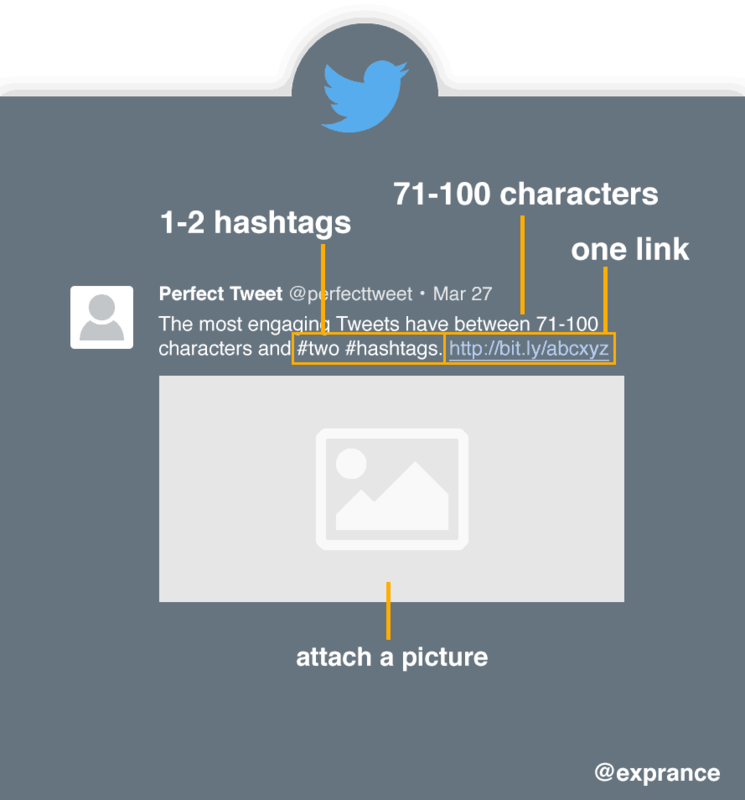 A picture is a necessity for your Tweet (see the easiest way to create the perfect social media image) and now Twitter lets you attach up to 4 pictures with no character penalties. Picture: no longer takes any characters from your 140 characters. Unless you’re Tweeting a quote or something text only, you’ll also want to include a link. Whether you shorten a link or not it will always take up the same space, 23 characters. That leaves you with 117 characters. It used to be that a pictures + link would leave you with only 93 characters. That’s no longer the case so you still have a comfortable 117 characters after all that. You still have to be brief with Tweets but there’s much more wiggle room with the recent updates (they’re already released). The modern hashtag was born on Twitter way back in 2007. While this wasn’t the birth of the hashtag, it was the first use of it on modern social media. I was using hashtags well before that though in the land of mIRC at least 5 years before this. That Tweet is the first one to include a hashtag and it proposes the use of hashtags. While hashtags are important for your Tweets engagement, 2 is the limit. If you go over the 2 limit then your engagement steadily begins to drop off according to the research cited in this post. You’re fine with one or two hashtags, but never venture into three or more. Before you start investing too much time posting on Twitter, be sure you have your Twitter profile set up for your business. 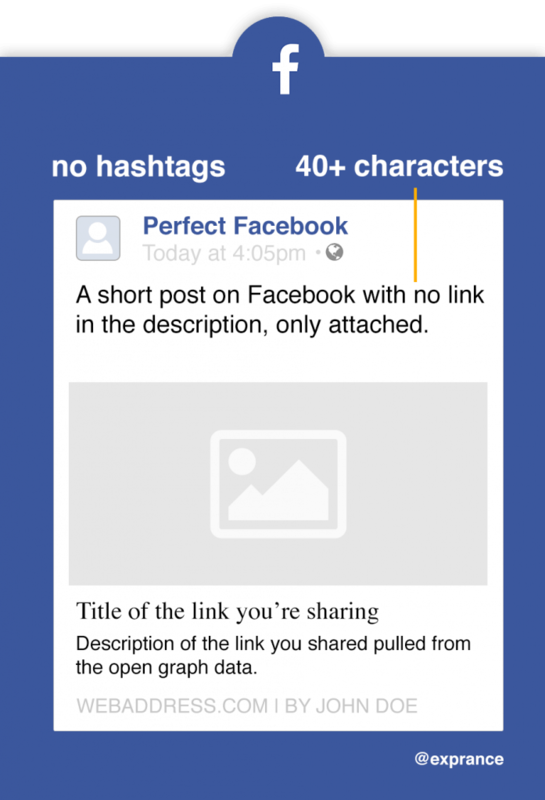 Surprisingly the ideal character count for a Facebook post can be less than a Tweet. It’s also surprising to me that the ideal Facebook post doesn’t use a single hashtag, they were never adopted well. Analysis of numbers from Facebook posts shows drastically inconsistent results. Some studies I found showed 40 characters were ideal while others showed that 80 or more words were better. I decided to go with the 40 character number as the base but it seems there’s no consensus. I would start with at least 40 characters but if you write too much, it needs to be for a good reason. In other words, it better be interesting. Research from EdgeRank Checker shows that in all circumstances, the best option is to leave hashtags out of Facebook. As you can see below, Facebook posts with hashtags have less viral reach than those without. This trend continues throughout all the research. 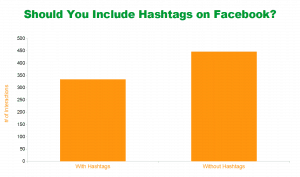 Posts without hashtags regularly outperform those with hashtags. This research is a bit stale now considering the rapid pace of social media (which is why I limit most of my Google searches to the past year) but there’s more recent research from BuzzSumo and QuickSprout in 2016 that almost mirrors the findings. As you can see the research behind this has consistently shown that hashtags on Facebook are not the best option. My personal experiments mirror these findings also. To fully take advantage of using Facebook for your small business, take the time to complete your Facebook page. Instagram is even more unique than Facebook. It’s unique because it’s primarily picture based, that means you have to do your best to describe the picture. 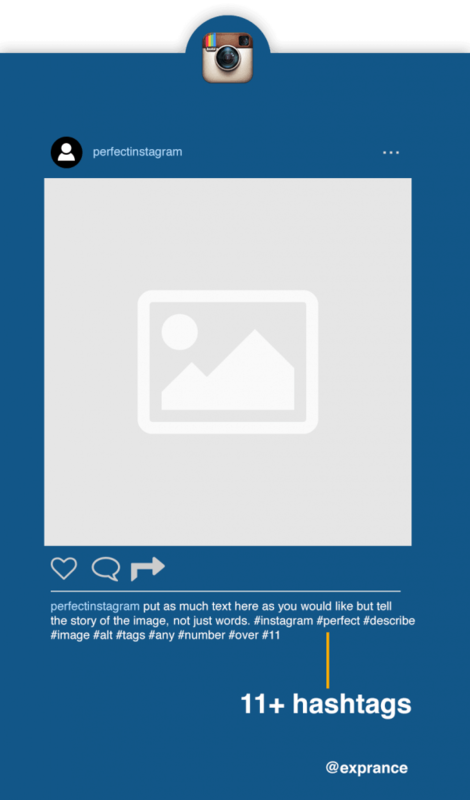 This will help you put together the best Instagram post you can to get more engagement (which Instagram is great for). Hashtags on Instagram are one of the single most important factors for how much engagement your post gets. Aside from how many followers you have, the hashtags help get your post out there into the community. If your picture is unique and stands out as people are browsing through images, you’re going to get noticed. 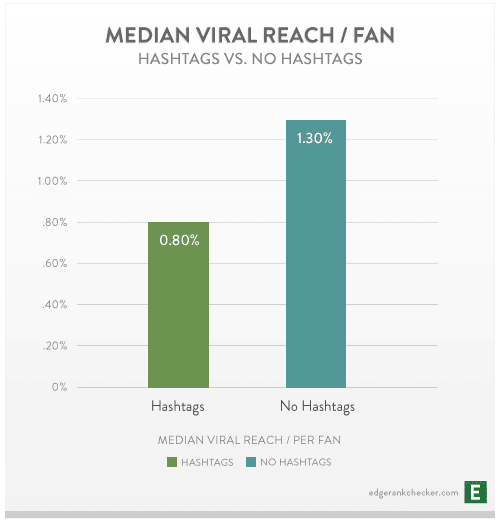 This is precisely why Instagram posts with 11 or more hashtags get better engagement. That doesn’t mean there’s a ceiling for hashtags either! The only rule of thumb to keep in mind is that your hashtags should be relevant. Don’t put a hashtag in just to have a hashtag. I didn’t include this one in the infographic because there’s no hard data on it, but it seems to be just as important. The better your description and the better it tells the story of your image, the more engagement you’ll get. The Instagram account is the perfect example of this. They include a thorough story behind each image they post. Including your image’s story not only helps orient the viewer, it also makes your picture more searchable. Images aren’t searched very easily with today’s technology (though that’s changing fast), so Instagram relies on what you write to help people searching find what they’re looking for. Make sure you read more about how to set up your Instagram profile for business. While Google+ doesn’t have nearly as many users as most other social media networks, it can still be a great place to reach specific audience types. Luckily, there’s not a lot to keep in mind when posting to Google+. Google+ make it easy to get your 3 hashtags because it auto-creates them based on your post content. If you’d like to manually include a hashtag, though, you’re more than welcome to do that also. While I put in the recommendation to include 1-3 hashtags for Google+, you’re a little more open than that. Google+ auto-creates 3 but really there isn’t a lot of research on exactly how many get the best engagement. Now it’s time for the full infographic with everything I just talked about but in a briefer and easier to digest format. The ever popular infographic format. So, without further ado, enjoy this infographic. Please share it if you find it helpful, others will too.